Skilled hand-maker or decorative anarchist? A man who understood the alphabet as a functioning refined, aesthetic, phonetic recognition system. In the third year of his uncomfortable apprenticeship to an architect he was offered, by Edward Prior, the job of inscribing letters on the new Medical School Prior was building at Cambridge. This opening freed Eric Gill from the enclosed world of the architects drawing office and offered him “a real job of work and no more sitting on an office stool drawing things for other people to do”. “Henceforth I gave up all ideas of becoming an architect and became a letter-cutter and monumental mason” This at the time seemed an “escape down from a gentlemanly profession to the rank of skilled artisan” “I went to Edward Johnston’s classes of writing and lettering at the Central School of Arts and Crafts. It was through Edward Johnston that I finally threw off the art nonsense of the Chichester art-school and got away, though not immediately, from the amateurishness of my efforts as an architect’s pupil”. Eric Gill progressed from being a pupil of Edward Johnston to being his assistant and sharing his rooms at Lincoln’s Inn. 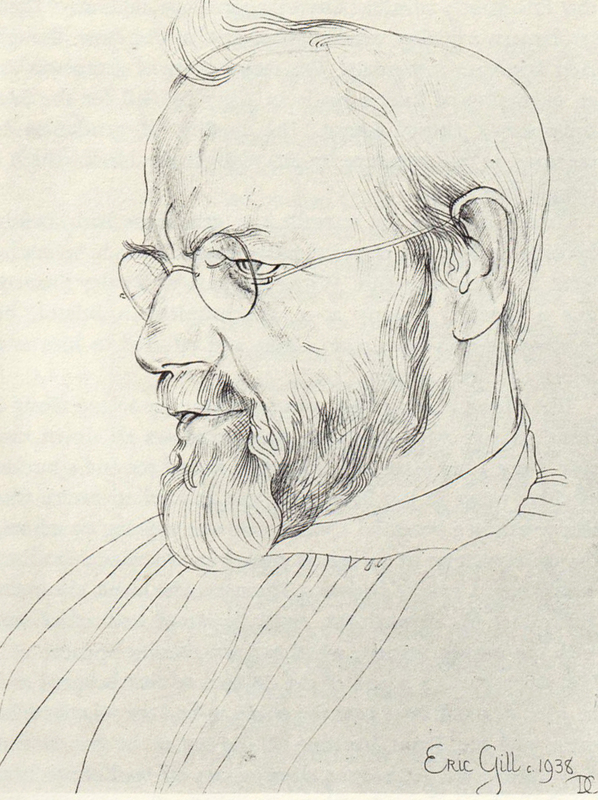 Eric Gill realised the vast range of knowledge and skills Edward Johnston had as a “former of letters”, He then began to emulate Edward Johnston’s philosophy as a designer and artist. 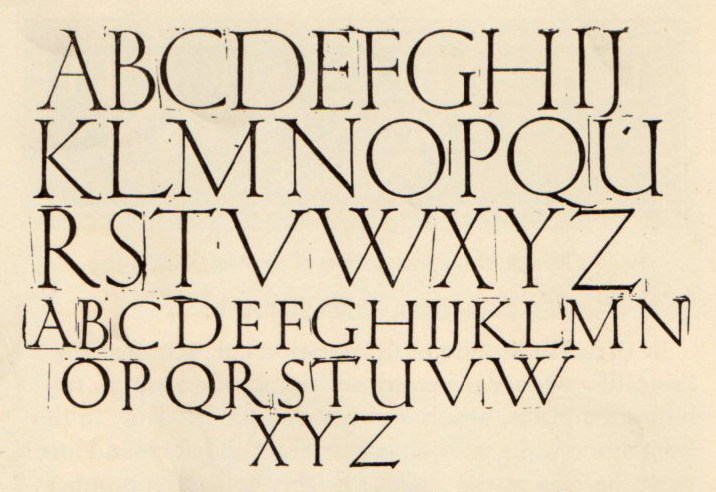 This led Eric Gill to perfect his own practice as a lettering artist (both pen and brush drawn calligraphy) and deepen his appreciation of the alphabet as a living, developing abstract information system. 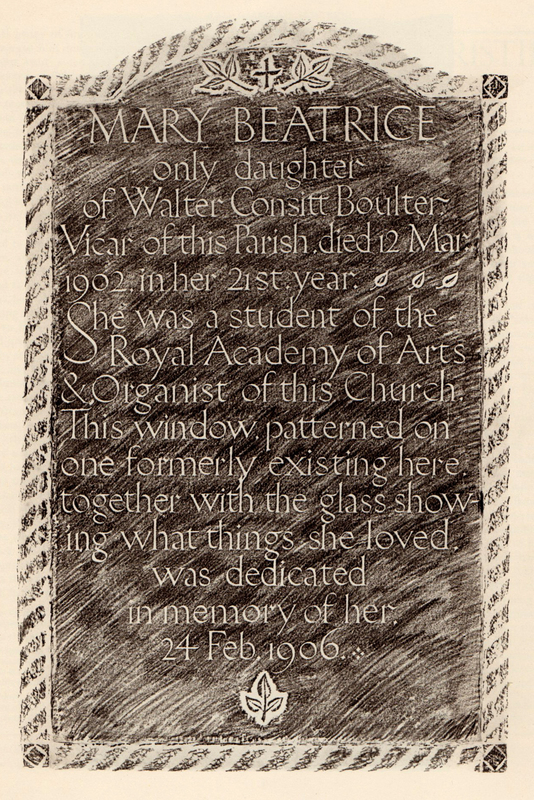 Eric Gill rapidly developed his own lettering skills and philosophy of design and often debated that letter-forms are a distinct area of design where there is no ambiguity as to the form, purpose or message in the artwork, unlike the emerging abstract forms of fine art with obscure messages hidden in the media. Fig four: Pasted-up drawing of an alphabet for Count Kessler, 1905. The first work which brought him to prominence was “Stations of The Cross” in Westminster Cathedral, this work was felt to be so important that his draft into military service (WW1 1914-18) was delayed until 14 September 1918 where he joined a RAF mechanical transport unit and as Eric Gill said ”served mammon”. Pigotts farmhouse and Chapel on a Buckinghamshire hilltop was the home and work place of the Gill family and associate artists. Eric Gill’s youngest daughter Joanna married René Hague in 1930, he had ambitions to become a printer. 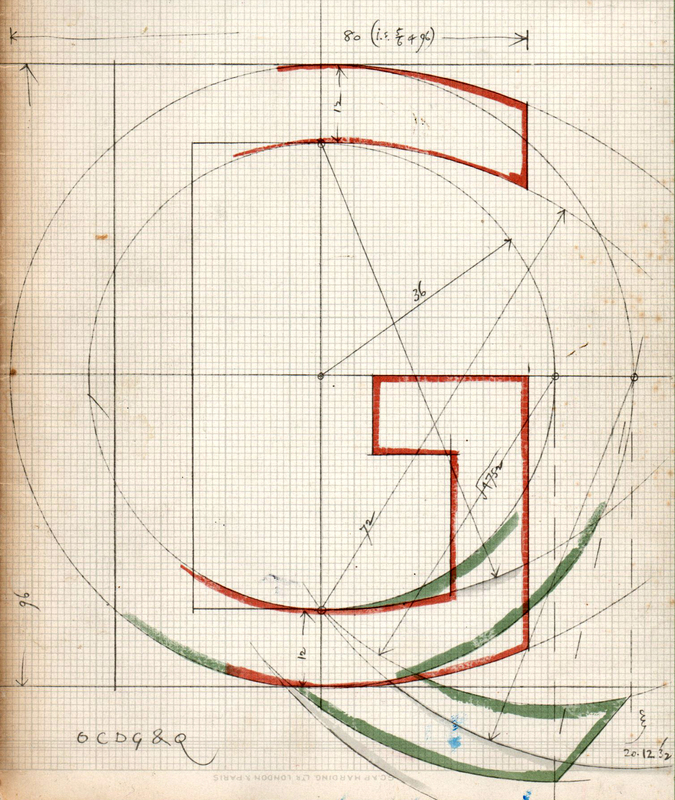 Gill who was fascinated with “typographical exigencies” entered enthusiastically into the printing-office project. A former barn at the back of the Pigotts quadrangle was converted into the printing-office of Hague & Gill, where they produced publications of their own design and for other customers. Many were illustrated with Gill’s engraving and notably his “essay on typography” printed on hand-made paper. Fig five: An actual reproduction of a trial page for Eric Gill’s Essay on typography 1931. Eric Gill began an association with the Lanstone Monotype Corporation and visited their headquarters at 43 Fetters Lane. London E.C.4. near Fleet Street, the home of the newspaper publishing and printing industry until the 1980′s. The company was one of the major suppliers of “hot-metal” typesetting machines to composing houses and printing-offices and produced type moulds “matrix” for many different type styles to fit their own machines. This appointment was brought about through Gill’s friendship with Stanley Morison who in 1922 was formally engaged by the Corporation as its “Typographical Adviser”. Stanley Morison was also associated with the University Press Cambridge in a similar roll at this time. A programme of new typographical designs, rational, systematic, modern and effectively fulfilling the future needs of the printing industry was put to Harold Malcolm Duncan, Managing Director at Monotype. Duncan’s foresight was fuelled by his broad education, knowledge of the industry, business experience and time as a technical journalist. Duncan took the immense economic risk at the time of the depression of commissioning and developing “New Typefaces”, rather than the previous practice of recreating the successfully designs from previous centuries to be used on “The New Mechanical Modern” fast hot-metal type-setting machines (to 1922 the machines had only been in existence for approximately 30 years). It was a massive undertaking to design and develop a new type-forms through all the design and manufacturing stages, would take months or years for initial designs to be approved, then large 10 inch high precise drawings of all the characters made, reduced by pantograph to make metal masters for cutting the steel “punches” which were used to “strike” the casting moulds from which the final “lead” printers types are cast. For the Times New Roman designed by Stanley Morison this amounted to 14,750 “punches” to cover all the re-designs, families of founts and point sizes and extra “sorts” (special characters). This process started in 1929 and completed 3rd October 1932 as the new fount was first fully published in the London Times newspaper. The appearance of San Serif typefaces had been an initial shock to the printing trade and public, in 1816 when William Caslon’s “Egyptian” appeared and was described as having a “swarthy appearance” and the common name of “grotesque” was given. The typeface gained popularity as people came to accept the typeface’s “loss of serifs”. 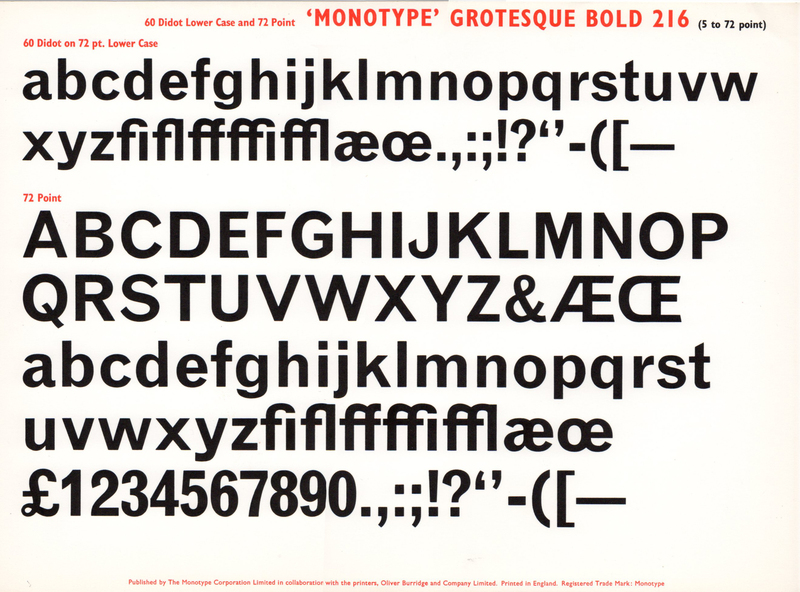 The image is taken from a published “Monotype” type specimen sheet. Edward Johnston designed a logical modern San Serif typeface for the London Underground on the suggestion put forward by Gerald Maynell of the “Westminster Press”, poster printer to the London Underground. Gerald Maynell introduced Edward Johnston to Frank Pick, the Underground’s commercial manager who had one of the world’s first “Branding Concepts” to promote and modernise the image of the underground railway. 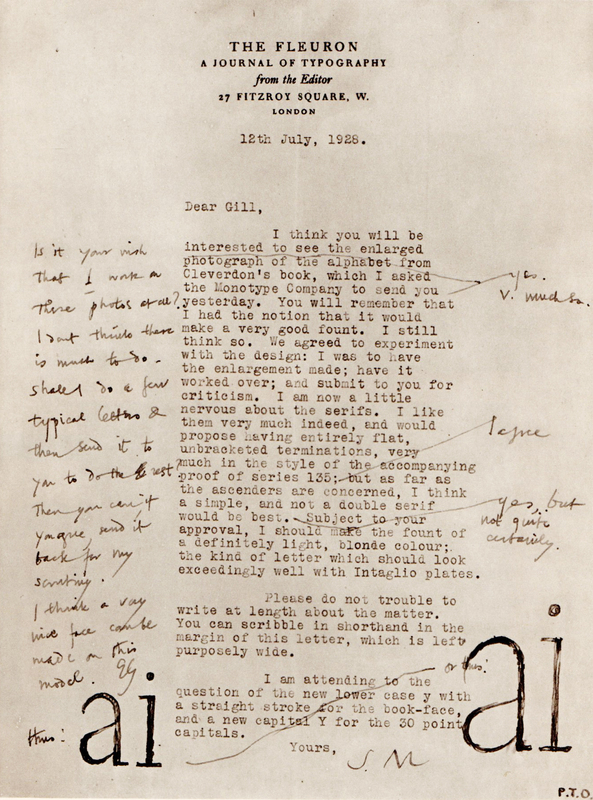 Fig seven: Gill’s hand written comments on a letter from Stanley Morison, the “blonde” type appeared as Monotype Solus. Eric Gill had independently been experimenting with designing and using San Serif typefaces, one example was Douglas Clevedon’s book shop in Charlotte Street, Bristol in 1926 and at his new home in Wales, Capel-y-ffin (moved 1924). He design and used “clear” San Serif lettering on “warning off signs” at the Welsh artist’s colony. Fig eight: Eric Gill’s rubbing of a name-plate for Douglas Clevedon. The San Serif idea had been seeded in Eric Gill’s mind by his association with Edward Johnston and the London Underground designs. 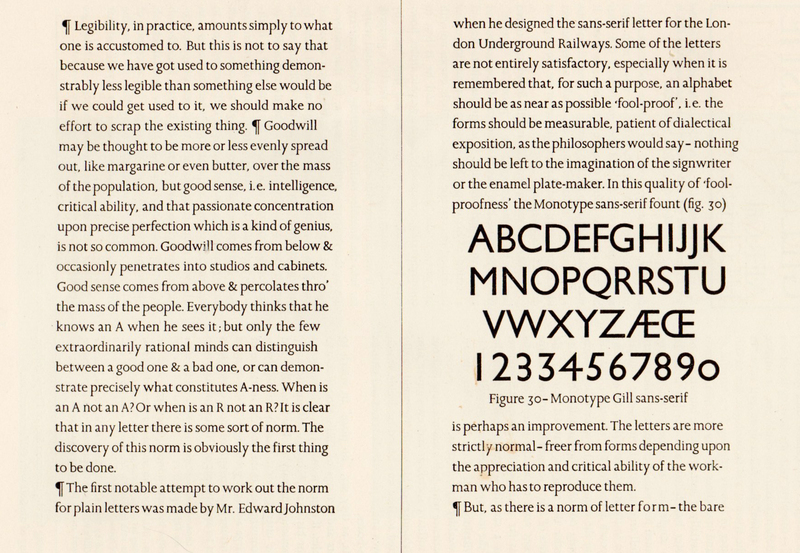 While working in Bristol at Cleverdon’s book shop Eric became ill with influenza and used his time during convalescence there to sketch, “easily understood and copied letters” in a book of hand-made paper, which Edward Johnston and Eric Gill used as a starting point for the Gill Sans prototypes. The “Modern Industrial Age occupied by buying and selling things, instead of hand crafting them” suited a plain working fount, loosened from the Roman Capitol form and the Lower Case styles originating from medieval pen drawn lettering. 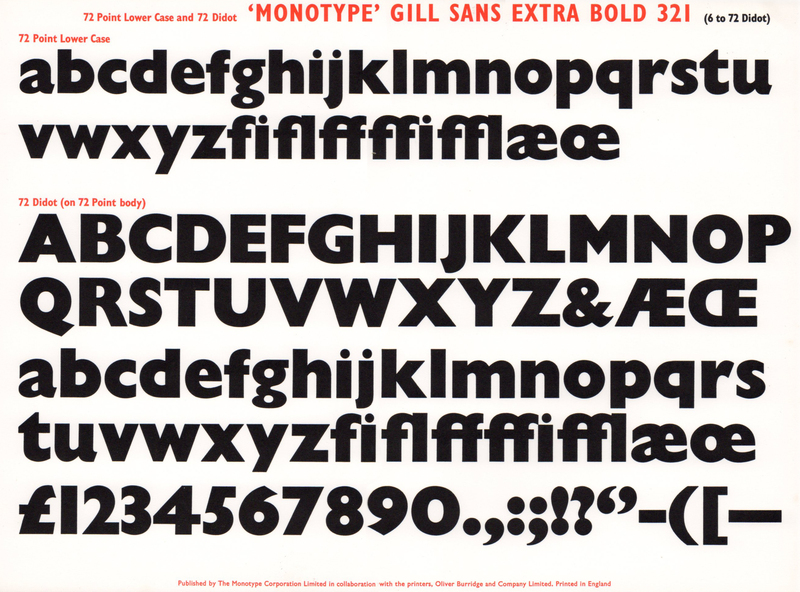 Fig nine: Monotype Gill sans extra bold 321, 72 point (“Monotype” specimen sheet). The titling capitals series 321 were the first to be published at the Annual Conference of the British Federation of Master Printers at Blackpool on “a striking pamphlet” printed for the audience at the publicity and selling session where Mr Stanley Morison warned of the dangers to the printing trade of allowing responsibility for typographic designs, pass to the hands of Print-buyers and his agent. Pencil and wash on graph paper. 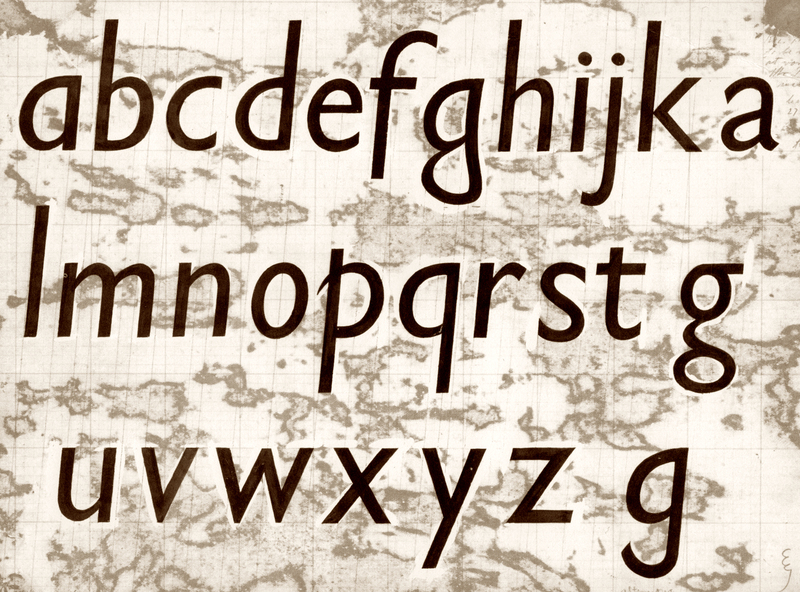 Fig eleven: Eric Gill’s drawing for Gill Sans italic lower-case. The business community had less reservations and accepted the modernity of the new impersonal typeface. The publicity manager Mr C.G.G. Dandridge of The Great London & North-Easten Railway system saw the Gill Sans typeface as a potential candidate for standardising all of the publicity and lettering of the company. He appreciated the simplicity and logic of the lettering, which made an immediate impact on him. Gill Sans impersonal elegance with the “fool-proof” simplicity would enable separate local printers, sign-writers and poster artists to produce a co-ordinated and comprehensive “corporate identity” for the railway from designs produced at the London layout office. The Gill Sans type face of 1928 was developed into a “family” of founts and was adopted by many organisations including the Church of England, the BBC, the first Penguin book jackets. The Gill Sans face became the “Printed Visual Medium” during WWll as it was used extensively by the Ministry of Information in public announcement propaganda leaflets and posters. Then after nationalisation Gill Sans became the face of British Rail, being used throughout the organisation. Fig twelve: Sections from “Monotype” specimen sheets 362 light 262 Gill Sans (medium) 275 Bold and 304 Shadow titling.